many of you live in areas where you get a lot of snow and the risk of being stranded is real. please take a few moments to familiarize yourself with these safety suggestions. be prepared! be safe! Blizzards are usually forecast well in advance but actual snowfall amounts and the impact the storm cannot be predicted with any accuracy. The experts are not able to predict precise snowfall amounts because a slight wind change or temperature increase can move the storm or alter the storms severity. This can cause an area to be blanketed in snow where the prediction was only for a mere dusting. The area where the storm was predicted to be the heaviest may receive the dusting. After this happens a few times, people tend to not believe and sometimes outright ignore the warnings, and thus do not properly prepare. Being prepared is especially important when you have to commute by vehicle in the winter months and preparations become even more important if you are planning an extended road trip. Road trips can take you in and out of various road conditions and climate zones in just a matter of hours in some cases. You may start your trip where the conditions are temperate and by late in the day you may be in the middle of a snowstorm. Fire Starting Materials, (cotton balls covered with petroleum jelly) emergency candles and a coffee can, can also be used to heat vehicle and lighting. Make sure to leave a crack to the window and I wouldn’t recommend falling asleep with it burning. Once you realize you are stranded remain with the vehicle unless there is an immediate danger in doing so. Place the glow sticks in the windows and attach signal flags by raising a back window on the material to hold in place, and do this on both sides. Make sure the exhaust pipe is not obstructed with snow or other debris. An obstructed tailpipe can force toxic fumes into the vehicle. You can run your vehicle’s engine for ten minutes at a time, every 45 minutes. This keeps the engine from getting too cold and will keep you warm as well. Make sure you have a window down a few inches to prevent carbon monoxide poisoning. Once settled in, avoid opening the doors to keep the heat inside the vehicle. Heat conducts from warm to cold so you must contain the heat around your body by using the blankets. 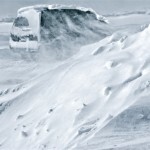 Most blizzards are accompanied by gale force winds resulting in whiteout conditions. This means you can become disorientated just a few feet from the vehicle. When you have to leave the vehicle, tie a rope to you and the vehicle to keep from becoming lost. Many people simply do not believe that you can be just a few feet from the car and become lost but you can and soon will drift farther away from the vehicle if you do not have a rope attached to you. Once the blizzards passes you may not be able to dig yourself out so attempt to make a signal fire and to help you warm up. The safest place for you is with the vehicle. If you are off the road out of sight from the road make sure to attach signal flags where you went off the road so passing motorists or rescue personnel can see them. Eat and urinate before sleeping. The body will have to work harder to keep the excess fluid warm and the digestive process will help keep you warmer as you sleep. Some of those that become stranded get an anxious feeling and believe that they should start walking for help. If you have no idea, how far civilization is away, walking from your vehicle, which is your only shelter, is dangerous and deadly. If you are close to civilization then road crews with plows and law enforcement will be out servicing the roads and looking for stranded motorist. If you were miles from civilization, you would likely not make it that far on foot without getting lost, injured and succumbing to hypothermia. Wandering off means that rescue personnel will find an empty vehicle. Stay put, wait for help, and if properly prepared you can quite easily survive the harshest of conditions if you do not panic and if you stay put inside your vehicle.